German Americans are the largest ethnic group in the United States, with over 45 million people, comprising over a fourth of the white population. They are concentrated in the Midwest, and in eastern metropolitan areas. They comprise numerous different groups, all of whom arrived speaking German. Some came in search of religious or political freedom, others for economic opportunities greater than those in Germany, and others simply for the chance to start afresh in the New World. Today California and Pennsylvania have the largest populations of German descent, with over six million Germans residing in the two states alone. The Midwest has the largest proportion of German Americans, with the group dominant in many rural areas. It is one of the two or three largest groups in many major metropolitan areas, including New York, Chicago, Baltimore and St. Louis. 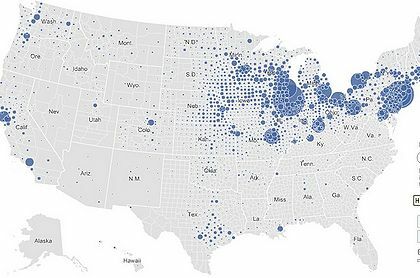 The rural Midwest from Indiana through the Dakotas has a large German population. The 100,000 Germans who came in the colonial era became farmers, with centers of settlement in southeastern Pennsylvania (where they are called "Pennsylvania Dutch"), upstate New York, and central North Carolina. They were mostly Lutheran and Reformed church members; the came in family-dominated groups for economic reasons. They were pushed out of Germany because the partible inheritance customs of their homeland meant that each child inherited a slice of the farm, and so farms were getting smaller and smaller. They found plenty of good, cheap land in America. After 1820 another 7 million arrived. Half went to farms in the Midwest. The other half went to cities, primarily port cities on the ocean (Baltimore, Philadelphia, Newark, New York), on the Great Lakes (Buffalo, Cleveland, Detroit, Chicago, Milwaukee), on the Ohio River (Pittsburgh, Cincinnati, Louisville), or the Mississippi (St. Louis and all cities north to St. Paul). There were a few cities not on rivers or lakes that attracted Germans, notably Columbus, Ohio, Indianapolis and Ft. Wayne, Indiana. During the 18th and throughout most of the 19th century Germans were usually the largest or second largest group of newcomers to the United States. Large numbers of Germans migrated into the U.S. from the 1680s to the 1760s. After a long pause, large numbers of Germans again came to the U.S. from 1840 to 1890. The four primary causes for Germans seeking a new life in America include push factors: worsening opportunities for farm ownership in Germany, persecution of some religious groups, and military conscription; and pull factors, with religious freedom and better economic conditions in the U.S., especially the chance for farmers to own land. The Germans who settled America were culturally and religiously diverse. The immigrants were as diverse as Germany itself, except that very few aristocrats or upper middle class businessmen arrived. Large sections of southeastern Pennsylvania and upstate New York attracted German immigrants in the period before the American Revolution. Most came from the German southwest, from along the Rhine, Main, Neckar, Ahr, and Mosel rivers. Crossing the Atlantic took two months and was dangerous, as 10% died en route from shipwrecks or disease. The first German settlement in Pennsylvania was founded in 1683. William Penn actively recruited in the Rhineland for his colony in 1679, producing the 1683 migration of Krefelder organized at Frankfurt that created "Germantown" (now part of Philadelphia). The tide to Pennsylvania swelled between 1725 and 1775, when they comprised a third of the colony's population. The Pennsylvania Germans were called "Pennsylvania Dutch" by English speakers who mistranslated "Deutsch" ("German") as "Dutch". They were comprised mostly of Lutherans and Reformed, along with smaller groups of Moravians, Mennonites, Amish, and other religious sects. They were famed for developing a rich religious life with a strong musical culture. There were few German Catholics or Jews in America before the 1830s. The German farmers were renowned for the highly productive animal husbandry and agricultural practices. Politically, there were inactive until 1740, when they joined a Quaker-led coalition that took control of the legislature, which generally supported the American Revolution. The Fries Rebellion was a rural protest movement among Pennsylvania Germans in 1799 against the direct federal tax on land and houses imposed by the Federalist Party in 1798 to pay for a threatened war against France. The resistance was in part a revolt of the Kirchenleute (Pennsylvania Germans of Lutheran and German Reformed background) against the Sektenleute (members of the pacifist Moravian and Quaker denominations, whom the Federalists favored with positions as tax assessors and collectors). The leaders of the rebellion were restrained and kept the protest movement under control, even withdrawing the protesters before the movement got out of hand. Some were convicted but President John Adams gave them pardons. Palatine migration to upstate New York was one of the largest single movements to colonial America. By 1711, for example, seven villages had been established in New York on the Robert Livingston manor. By 1750, the Germans occupied a 12-mile stretch along the left bank of the Mohawk River. The soil was excellent; some 500 houses had been built, mostly of stone; and the region prospered in spite of Indian raids. Herkimer was the best-known of the German settlements in a region long known as the "German Flats." The most famous figure was editor John Peter Zenger, who led the fight for freedom of the press in America. Later John Jacob Astor, a German immigrant from Baden, became the richest man in America from fur trading and New York City real estate. New Bern was the center of German settlement in North Carolina. After the failure of the Revolutions of 1848 thousands of well-educated German patriots fled Germany to the United States, England and Australia. Among the Forty-Eighters who became notable in the US were Carl Schurz, Franz Sigel, Louis Blenker, Alexander Schimmelpfennig, and Friedrich Hecker. They formed communities within New York, St. Louis and Cincinnatti, and became a prominent part of the populations of Wisconsin and Texas. Almost universally, they hated slavery and joined the Union Army in great numbers during the American Civil War. A large German colony in Virginia called Germanna was located near Culpeper; it was founded by two waves of colonists in 1714 and 1717. Large settlements were formed in North Carolina, especially the Moravian town of Salem. They included peasant farmers and intellectuals; Protestants, Catholics, Jews, and atheists; Prussians, Saxons, Hessians, and Alsatians; abolitionists and slaveowners; farmers and townsfolk; frugal, honest folk and ax murderers. They differed in dialect, customs, and physical features. A majority had been farmers in Germany, and most arrived seeking economic opportunities. A few dissident intellectuals fleeing the 1848 revolutions sought political freedom, but few, save perhaps the Wends, went for religious freedom. The German settlements in Texas reflected their diversity. Even in the confined area of the Hill Country, each valley offered a different kind of German. The Llano valley had stern, teetotaling German Methodists, who renounced dancing and fraternal organizations; the Pedernales valley had fun-loving, hardworking Lutherans and Catholics who enjoyed drinking and dancing; and the Guadalupe valley had atheist Germans descended from intellectual political refugees. The scattered German ethnic islands were also diverse. These small enclaves included Lindsay in Cooke County, largely Westphalian Catholic; Waka in Ochiltree County, Midwestern Mennonite; Hurnville in Clay County, Russian German Baptist; and Lockett in Wilbarger County, Wendish Lutheran. In the 21st century half of Wisconsin's population claims some German heritage, as do large proportions in nearby areas of northern Illinois, Iowa and Minnesota, as well as the Dakotas. Historians stress the importance of "pull" and "push" factors in explaining immigration. Wisconsin offered the promise of religious freedom, jobs, a climate and landscape that reminded many Germans of the forests at home, where forests played a core role in German collective identity, national memory, and socioeconomic stability. Even better the state offered cheap, good quality land on which they could grow familiar crops such as barley and wheat; it was especially well suited for dairy farming. Farmers enjoyed new freedom in being able to make their own decisions about agricultural production as opposed to being regulated by communal authorities. Catholics and Lutherans came in about equal numbers; they settled near each other but did not interact socially or intermarry. Migration was primarily by extended family units so the first arrivals wrote enthusiastic letters to family and kin about their new life, and others joined them in a process of chain migration. Most bought their land from Yankee landowners who had purchased title from the federal government. The farms in the Midwest were much larger than those in Germany, and required larger family sizes. The state of Wisconsin systematically encouraged immigration by establishing an Office of the Commissioner of Emigration in 1852 and placing a commissioner in New York to greet them with promotional materials written in English and German. Germans were allowed to vote before establishing U.S. citizenship. About half of the immigrants settled in Milwaukee, Chicago, Davenport, Dubuque and many smaller cities, with the others heading for farms and small towns. In Milwaukee, Wisconsin the heavy German influx started in the late 1840s, changing a small Yankee settlement to a large predominantly German city. By the 1850s more than half of the city was part of "Germania". From the beginning, Germans concentrated on the west side, and by 1900 they dominated the entire northwest side; some also moved to the newly developed south side. The occupational patterns in Germania mirrored the social diversity of the group, which soon after its arrival became well-established in city life. Religiously it was divided about equally into Protestants (mostly Old Lutherans of the Wisconsin Synod or Missouri Synod), Freethinkers (many of them refugees from the failed 1848 Revolution), and Catholics. Germans divided politically between the Democrats and the Republicans; after 1900 many joined the Socialist Party. Germans organized the labor movement in the city, with strength especially in the brewing and construction industries. Germania developed a wide range of ethnic organizations and institutions. There were German Catholic and Lutheran parishes and parochial schools, secret lodges, insurance and mutual-aid societies, labor unions, political and cultural clubs, theaters, bands, singing societies, fire brigades, and militia units. Germans also developed an ethnic press that represented different political orientations. In the colonial era several thousand Reformed Swiss settled in South Carolina from Charleston to Orangeburg and along the Savannah River at Purrysburg. Over 250,000 German-speaking Swiss arrived, 1820-1920; they had previously been mountain farmers, but most settled in rural America and sought out high quality flat lands; the 3,520 who were scattered through the mountains of Tennessee, Kentucky and West Virginia were the exception. New Glarus, Wisconsin, originally an all-Swiss dairy town, has become a tourist center featuring the Swiss American German language heritage. In terms of religion, most Swiss immigrants were Reformed or Lutheran and merged into larger German communities. Some were Mennonites or belonged to small, highly traditional sects like the Amish. They formed tight-knit closed communities that still exist. The German Russians or "Volga Germans" were the most traditional of all German-speaking arrivals. They were Germans who had lived for generations along the Volga River in Russia; about 100,000 immigrated by 1900 and settled in relatively poor lands in the Dakotas, Kansas and Nebraska—the south-central part of North Dakota was known as the German-Russian triangle. They were Lutherans, Mennonites or Catholics but no educated Germans-speaking pastors, teachers, professional men, or tradesmen had joined the peasants who migrated to America. The older generation was still speaking German (they never spoke Russian) in the 1940s, while the next generation was bilingual. Negatively influenced by their miseries and isolation in Russia, they saw themselves a downtrodden class cheated by townspeople, businessmen and railroads; they raised large families with harsh discipline; they wanted their children to be farmers so took them out of school around age 14; they treated their womenfolk as inferior, and were slow to diversify their farms. Many farmers specialized in sugar beets—still a major crop in the upper Great Plains. In World War I (1917–18) their patriotism was ambiguous; distrusted by their neighbors they rejected prohibition and Americanization efforts and supported radical far-left political movements such as the NPL ("Non-Partisan League"). Germans brought many different religions with them. The largest numbers were Catholic or Lutheran, although the Lutherans were themselves split several ways. The more conservative groups comprised the Lutheran Church - Missouri Synod and the Wisconsin Evangelical Lutheran Synod. Other Lutherans formed a complex checkerboard of synods, most of which in 1988 merged, along with Scandinavian synods, into the Evangelical Lutheran Church in America. Still other German Protestants were not Lutherans but were descendants of the united "Evangelical Church" in Germany. They created the Reformed denomination (especially strong in New York and Pennsylvania), and the Evangelical denomination (strongest in the Midwest). The Evangelical and Reformed groups are now part of the United Church of Christ. Many immigrants joined quite different churches from those in Germany, especially the Methodist church. Swiss-born Philip Schaff (1819–93) became a leading theologian and church historian in America. He returned often to Europe after his 1844 emigration to the U.S. Schaff's life was remarkably consistent and resilient; as he emigrated, he absorbed a moderate many American traits, adapting to the new world culture with ease, but maintained close intellectual and social ties with Germany. Schaff formulated a developmental, organic, providential view of history and a unique mediating evangelical theology that accommodated such figures as Hegel and Schleiermacher, tolerated liberal positions, yet remained nevertheless orthodox and fundamentalistic. 1850 census map shows rural Lutheran population. Nearly all were German since few Scandinavians had arrived yet. Before 1800, Amish, Mennonites (from Witzerland), and Hutterite arrived in groups and formed closed communities in Pennsylvania; they are still in existence today and some still speak dialects of German. They set out branches into the Midwest. Dwight D. Eisenhower was born into a one such community in Abilene, Kansas. Following the failed 1848 revolutions in German states, a wave of political refugees fled to America. They were well educated and secular; their most prominent leader was Carl Schurz. Many German Jews arrived in the late 19th century, often setting up clothing stores in small cities across the country, such as the Goldwater Department Store in Phoenix, Arizona. (see Barry Goldwater). Socialists who arrived after 1870 were generally hostile to religion. In Germania (the German-American districts of cities) a beer culture flourished in 19th century America. Germans operated nearly all the nations brewries, and demand was high until prohibition arrived in 1920. German immigrants acquired a reputation rivaling the Irish for heavy drinking and alcohol-associated violence. By the late 19th century family-oriented beer gardens provided all day recreation on Sundays. German newspapers promoted temperance but not abstinence. From the German perspective the issue was less the ill effects of alcohol than its benefits in promoting social life. For American Germans, the pub stood alongside the church as one of the two pillars of German social and spiritual life. Most Germans were farmers, workers, craftsmen or operated small businesses like local breweries. The influence of their cuisine is seen in sausages, meats, pastries and pretzels. Germans almost totally dominated the beer industry since 1850. At a more advanced level Germans have contributed to a numerous areas in American culture and technology. Baron von Steuben, a former Prussian general staff captain, led the reorganization and training of the Continental Army during the American Revolution. Carl Schurz helped found the Republican party, while most Germans voted Democratic. After the Nazis came to power in 1933 thousands of scientists, artists, intellectuals and scholars fled to the U.S. The most famous was Albert Einstein. After World War II, Wernher von Braun, and most of the leading engineers from the former German V-2 rocket project were brought to the U.S. They took the lead in designing military rockets, as well as of rockets for the NASA space program. Three highly influential intellectuals were diplomat Henry Kissinger and political philosophers Hannah Arendt and Leo Strauss; Strauss was the founder of the Neoconservative movement. German Americans had strongly opposed American entry into the World War. With rare exceptions they did not favor Germany; rather they demanded neutrality. Their position was increasingly marginalized and ignored; a small minority of Congressmen (usually from heavily German districts) voted against the war in April 1917. During the war Germania was watched closely for signs of disloyalty, which seldom were found. One German was killed in a tavern brawl on political grounds. Nativism took on three different styles. Common acts, such as eliminating German language teaching in schools and encouraging the purchase of Liberty Loan Bonds, occurred across the U.S. Collective action, such as intimidation and violence, occurred mostly in smaller towns and rural areas where Germans compruise 5% to 40% of the population, and where local Anglo elites like newspapers editors and mayors demanded it. Symbolic action, such as changing street names (in Cincinnati, for example, German Street became English Street), was the norm in the larger cities, where city newspapers denounced violence. The German-American communities in cities such as Cincinnati were already in decline by 1918. During World War I, intense scrutiny of German Americans led to a debate about the definition of American culture. The central question was the status of "hyphenated Americans," a term which became nearly synonymous with German Americans and their perceived challenge to American integrity. Thus, the hyphen became a term not simply for discussing cultural minorities but also for discussing the dominant culture's relationship with Britain. In Indianapolis, Indiana, German Americans comprised over a fourth of the population and supported numerous clubs and associations to perpetuate German culture, By lobbying the school board they were able to establish an extensive program of German-language instruction in the city's primary and secondary public schools. The World War, however, generated intense patriotism and a concurrent intense hostility toward all things German. In October 1917, a new federal legislation required every German-language newspaper to file sworn translations of war-related articles with local postmasters; most smaller papers could not afford the cost and closed down. In this atmosphere, the school board responded to assertions that teaching German was promoting the enemy's culture by banning German instruction in elementary schools in January 1918. Anti-German sentiment continued even after the war, and the Indiana legislature in 1919 banned all German-language instruction in all Indiana public and private schools. The Indianapolis story was typical of cities where the Germans did not have a majority of votes. Unlike Canada and Australia, which imprisoned German citizens, the German Americans were pressured into buying war bonds but were not imprisoned. In 1910 German Americans lived in had created their own distinctive, vibrant, prosperous German-language communities, called "Germania". The transition to an English language world was abrupt, forced by the World War. After 1917 the German language was seldom heard in public; most newspapers and magazines closed; churches and parochial schools switched to English. Youth increasingly attended high schools, where they mingled, in English, and dated other ethnics. The Catholic high schools were deliberately structured to commingle ethnic groups so as to promote intermarriage. German-speaking taverns, beer gardens and saloons were all shut down by prohibition; those that reopened in 1933 spoke English. By the 1940s Germania had largely vanished outside remote areas and the Germans were thoroughly assimilated. Historians have traced the highly complex voting patterns. Down until 1912, Catholic Germans were heavily Democratic, Protestants were split between the parties, and Jewish Germans voted Republican. Secular Germans split, with many workers voting Socialist. In 1896 all the groups were alienated by William Jennings Bryan and moved toward the GOP. They moved back in 1900. The double blows of prohibition and anti-German agitation in 1917-20 alienated German Americans. In Wisconsin they moved o support Robert LaFollette, who became their champion in the state and in 1924, nationally. In 1928 Germans voted along religious lines, with the Protestants for Herbert Hoover and the Catholics for Al Smith. Roosevelt won most of the German to the New Deal Coalition in 1932 and 1936. In 1940 large fraction of the German-American voters switched to Wendell Willkie, who of course was of German descent himself. As Willkie crusaded against the anti-business excesses of the New Deal, the Democrats counter-crusaded, arguing that the danger of an internal fifth column was grave, and broadly suggesting that Willkie along with isolationists like Lindbergh was pro-Nazi. Although FDR promised there would be no repeat of the anti-Hun hysteria of the First War, distrust levels were high. Of course, everyone knew what was happening to the Japanese on the West Coast. During the war the federal Office of War Information sponsored numerous polls to monitor possible disloyalty or slackerism. NORC did a study in spring 1942, based on two nationwide surveys. The Germans were slightly more hostile to Britain than non-Germans, and exactly the same versus USSR. People with both parents born in Germany were slightly less hostile to Germany (only 11% wanted to "destroy Germany as a nation" vs 26% of the whole US; only 19% thought Germany has used poison gas in ww2, versus 33%). People with one parent born in Germany were almost exactly like the national average. None of the reports indicated any pro-Nazi sentiment whatever. President Roosevelt made a deliberate effort to reassure Germans there would be no attacks on their culture as happened in World War I. Indeed, he appointed two prominent Americans of German descent to top commands in the Army and Navy, General Dwight D. Eisenhower in Europe and Admiral Chester Nimitz in the Pacific. The Germans enthusiastically supported Dwight D. Eisenhower, another German-American in 1952 and 1960, and in 1960 they split along religious lines just as in 1928. Since 1960 German identity has become so weak it is not much of a factor in partisanship. articles by Frederick C. Luebke, "Austrians," pp. 164–171; Kathleen Neils Conzen, "Germans," pp. 405–425; La Vern J. Rippley, "Germans from Russia," pp. 425–430; Arthur A. Goren, "Jews," pp. 571–598, esp. 576-579; Don Yoder, "Pennsylvania Germans," pp. 770–772; Leo Schelbert, "Swiss," pp. 981–987. Barrick, Mac E., ed. German-American Folklore.(1987). 264 pp. Kamphoefner, Walter D.; Helbich, Wolfgang; and Sommer, Ulrike, eds. News from the Land of Freedom: German Immigrants Write Home. (1991). 645 pp. Luebke, Frederick C. Germans in the New World: Essays in the History of Immigration (1990). Shaw, Stephen J. The Catholic Parish as a Way-Station of Ethnicity and Americanization: Chicago's Germans and Italians, 1903-1939. (1991). 206 pp. ↑ That is, American of German descent outnumber both African Americans and Latinos. ↑ Russell A. Kazal, Becoming Old Stock: The Paradox of German-American Identity (2004). ↑ "A Study of the Effect of German and Italian Origin on Certain War Attitudes" (NORC special Report #6, copy in NORC, University of Chicago). Thernstrom, Stephan ed. Harvard Encyclopedia of American Ethnic Groups, (1980). Adams, Willi Paul. The German-Americans. An Ethnic Experience. American Edition by LaVern J. Rippley and Eberhard Reichmann. Indianapolis: Max Kade German-American Center, Indiana Univ.-Purdue Univ., 1993. Barclay, David E., and Elizabeth Glaser-Schmidt, eds. Transatlantic Images and Perceptions: Germany and America Since 1776 (1997). Bohlman, Philip V. and Holzapfel, Otto, eds. Land without Nightingales: Music in the Making of German-America. (2002). 301 pp. Ellis, M. and P. Panayi. "German Minorities in World War I: A Comparative Study of Britain and the USA." Ethnic and Racial Studies 17 (April 1994): 238-59. Engle, Stephen D. Yankee Dutchman: The Life of Franz Sigel. (1993). 416 pp. Hegi, Ursula. Tearing the Silence: On Being German in America (1997). Helbich, Wolfgang, and Walter D. Kamphoefner, eds. German-American Immigration and Ethnicity in Comparative Perspective. Madison: Max Kade Institute for German-American Studies, 2004. 370 pp. ISBN 978-0-924119-18-7. Hobbie, Margaret, ed. Museums, Sites, and Collections of Germanic Culture in North America (1980). Keil, Hartmut, ed. German Workers' Culture in the United States, 1850 to 1920. (1988). 330 pp. Keller, Phyllis. States of Belonging: German-American Intellectuals and the First World War. (1979). 324 pp. Keresztesi, Michael and Cocozzoli, Gary R., eds. German-American History and Life: A Guide to Information Sources. (1980). 372 pp. Levine, Bruce. The Spirit of 1848: German Immigrants, Labor Conflict, and the Coming of the Civil War. (1992). 378 pp. Rapone, Anita. The Guardian Life Insurance Company, 1860-1920: A History of a German-American Enterprise. (1987). 209 pp. Shore, Elliott; Fones-Wolf, Ken; and Dankey, James P. The German-American Radical Press: The Shaping of a Left Political Culture, 1850-1940. (1992). 247 pp. Trefousse, Hans L., ed. Germany and America: Essays on Problems of International Relations and Immigration (1980). Fogleman, Aaron Spencer. Hopeful Journeys: German Immigration, Settlement, and Political Culture in Colonial America, 1717-1775 (1995). Otterness, Philip. Becoming German: The 1709 Palatine Migration to New York. (2004). 227 pp. Roeber, A. G. "In German Ways? Problems and Potentials of Eighteenth-Century German Social and Emigration History." William and Mary Quarterly 3d ser., 44, no. 4 (1987). Roeber, A. G. " 'The Origin of Whatever Is Not English Among Us': The Dutch-speaking and the German-speaking Peoples of Colonial British America." In Strangers Within the Realm: Cultural Margins of the First British Empire, edited by Bernard Bailyn and Philip D. Morgan (1991). Wokeck, Marianne S. "Harnessing the Lure of the 'Best Poor Man's Country': The Dynamics of German-speaking Immigration to British North America, 1683-1783." In To Make America: European Emigration in the Early Modern Period, edited by Ida Altman and James Horn (1991). Bayor, Ronald H. Neighbors in Conflict: The Irish, Germans, Jews and Italians of New York City, 1929-1941. (1978). 232 pp. Coburn, Carol K. Life at Four Corners: Religion, Gender, and Education in a German-Lutheran Community, 1868-1945. (1992). 227 pp. Conzen, Kathleen Neils. Immigrant Milwaukee, 1836-1860: Accommodation and Community in a Frontier City. (1976). 300 pp. Detjen, David W. The Germans in Missouri, 1900-1918: Prohibition, Neutrality, and Assimilation. (1985). 244 pp. Gerber, David A. The Making of an American Pluralism: Buffalo, New York, 1825-1860. (1989). 531 pp. Jaehn, Tomas. Germans in the Southwest, 1850-1920. (2005). 242 pp. Kamphoefner, Walter. The Westfalians: From Germany to Missouri (1987). Marshall, Howard Wight and Goodrich, James W., eds. The German-American Experience in Missouri: Essays in Commemoration of the Tricentennial of German Immigration to America, 1683-1983. (1986). 218 pp. Nadel, Stanley. Little Germany: Ethnicity, Religion, and Class in New York City, 1845-80. (1990). 242 pp. Pickle, Linda Schelbitzki. Contented among Strangers: Rural German-Speaking Women and Their Families in the Nineteenth-Century Midwest. (1996). 311 pp. Probst, George Theodore. The Germans in Indianapolis, 1840-1918. (1989). 200 pp. Schneider, Dorothee. Trade Unions and Community: The German Working Class in New York City, 1870-1900. (1994). 273 pp. Struve, Walter. Germans and Texas: Commerce, Migration, and Culture in the Days of the Lone Star Republic (1996). Tischauser, Leslie V. The Burden of Ethnicity The German Question in Chicago, 1914–1941 (1990). vanRavenswaay, Charles. The Arts and Architecture of German Settlements in Missouri: A Survey of a Vanishing Culture. (1977). 536 pp. Wyman, Mark. Immigrants in the Valley: Irish, Germans and Americans in the Upper Mississippi Country, 1830-1860. (1984). 258 pp. Zeitlin, Richard H. Germans in Wisconsin. (2000). 72 pp. Alderfer, E. Gordon. The Ephrata Commune: An Early American Counterculture. (1985). 273 pp. Atwood, Craig D. Community of the Cross: Moravian Piety in Colonial Bethlehem. (2004). 283 pp. Barkai, Avraham. Branching Out: German-Jewish Immigration to the United States (1994). Behney, J. Bruce and Eller, Paul H. The History of the Evangelical United Brethren Church. (1979). 423 pp. Coburn, Carol K. Life at Four Corners: Religion, Gender, and Education in a German-Lutheran Community, 1868–1945 (1992). Dolan, Jay P. The Immigrant Church: New York's Irish and German Catholics, 1815-1865. (1975). 221 pp. Longenecker, Stephen L. Piety and Tolerance: Pennsylvania German Religion, 1700-1850. (1994). 195 pp. McMaster, Richard K. Land, Piety, Peoplehood: The Establishment of Mennonite Communities in America, 1683-1790 (1985). Mauch, Christof and Salmons, Joseph, eds. German-Jewish Identities in America. (2003). 171 pp. Riforgiato, Leonard R. Missionary of Moderation: Henry Melchior Muhlenberg and the Lutheran Church in English America. (1980) 250 pp. Roeber, A. G. Palatines, Liberty, and Property: German Lutherans in Colonial British America (1998). Scholz, Robert F. Press Toward the Mark: History of the United Lutheran Synod of New York and New England, 1830-1930 (1995). Walch, Timothy. The Diverse Origins of American Catholic Education: Chicago, Milwaukee, and the Nation. (1988). 235 pp. Kamphoefner, Walter D. and Helbich, Wolfgang, eds. Germans in the Civil War: The Letters They Wrote Home. (2006). 521 pp. Keil, Hartmut and Jentz, John B., eds. German Workers in Chicago: A Documentary History of Working-Class Culture from 1850 to World War I. (1988). 427 pp. This page was last modified on 9 April 2019, at 09:19. This page has been accessed 37,665 times.